Brockville, Ontario – The Ottawa Jr. Senators took game two of the Bogart Cup Semi-Final 5-2 over the Brockville Braves on Tuesday night at the Brockville Memorial Center. Ottawa’s depth was on full display in their game two victory. Five different players had a goal, as Adrien Bisson, Kyle Jackson, Darcy Walsh, Conor Smart and Faisal Alsaif scored. Adrien Bisson set the tone early for OJS, scoring the opening goal early in the first period. He intercepted the puck at the left boards, and fired it over Liam Souliere for a 1-0 lead. Brockville later tied the game twice, but lost the lead quickly. In the final minutes of the first period, Kyle Jackson (1G/2A) scored just 10-seconds after the Braves Sam Allison tipped in Simon Mack’s point-shot. Then Darcy Walsh capped off his two-point game (1G/1A) with the game-winner towards the end of the second period, as he gave OJS the 3-2 lead. Walsh got the monkey off his back, scoring his first since game three against Kanata. Adrien Bisson (who was picked as our Player of the Game) said that the first goal gave them a lot of momentum. Bisson says that Ottawa’s victory was because they outworked the Braves. Ottawa takes a 2-0 series lead against Brockville for the third straight year. Last year they won the first two games, but dropped game three before going onto win game seven at home. Game three will be tonight inside the Jim Durrell Sports Complex at 7:30. 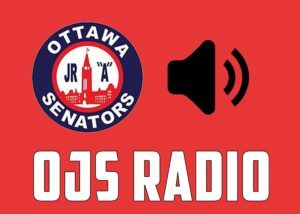 You can catch the broadcast on mixlr.com/ojsradio, CKDJ 107.9 and Hockey TV.